"We have a very daring and skilful opponent against us, and, may I say across the havoc of war, a great general." - British Prime Minister Winston Churchill speaking about German General Erwin Rommel before the House of Commons. As 1941 opened Great Britain had its back against the wall. Its only bright spot was defending North Africa against the Italians. Then Germany's General Erwin Rommel arrived in the desert and began the legend of the Afrika Korps. Rommel came within miles of severing the colonial life line of the British and crippling its Empire. 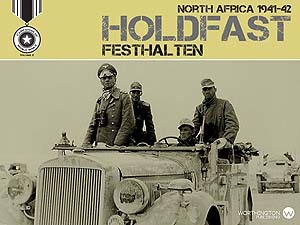 Now you are in command reliving the great campaigns of World War II desert warfare with the game Holdfast North Africa. Fast tanks, steady infantry and grand sweeping movements across the desert were the tactics of the campaigns. But supply limits how far you can go and the choices you must make. The game uses the highly rated Holdfast game system with short playing time, fog of war, easy to learn mechanics and deep strategy.